Photo caption: Maya Deren: Looking for a flying saucer? The samples of modern “art” which demand (and are given) a thousand lines of carefully written prose to explain the artist’s meaning have nothing on three short films to be shown tonight at the Berkshire Museum as one of the features of members’ night. Maya Deren, who conceived and is featured in each of the silent strips of acetate sent along a few pages to explain what the spectator will see tonight. People will like the movie tonight for varying reasons, one of which being that it won’t take long – 33 minutes. And Maya is interesting to look at. In those 33 minutes she glides down a rock precipice, goes swimming, gets murdered, almost drowns (we thought), and does quite a bit of running and walking. She has big strong legs. Those liking abstruse symbols can wonder why keys come out of her mouth or why flowers (said to be symbolic of fertility) are dropped on a white pillow. When the key comes from her mouth, there is a reasonably absorbing close-up of Miss Deren’s lips. With Miss Deren’s offerings will be other more conventional shorts, including a history of the animated cartoon. First showing will be at 8, and Museum authorities promise a second run-through after the talk to be given by Frank Crowninshield. 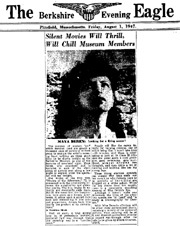 Underground Film Journal notes: Well, this is how Maya Deren built her reputation: By traveling around to small town museums with her films. Alas, she most likely had to put up with lots of condescending articles in the local newspapers like the one above. For shame. But, more power to her. She was an artist and a visionary and is remembered way more than whatever hater wrote the above.